Same as for the first chapter of our series about sumo jobs, dedicated to Tokoyama, Harumi Hotta met with a yobidashi who agreed to tell us about his activities. It was yobidashi Kokichi, who belongs to Kiriyama-beya. Le Monde du Sumo: How are yobidashi usually recruited? Kokichi: There are several ways. Some people are introduced by a Koenkai (official supporters of the heya), some enter by themselves. Kokichi: Most of them enter the sumo world at 15 years. I became a yobidashi at that age. LMdS: Why (and when) did you decide to become a yobidashi? Did you never want to become a rikishi? Kokichi: I wanted to work in the sumo world because I liked sumo. At first, I wanted to be a rikishi; however, my height and weight were not sufficient. But then, Kurosegawa oyakata told me that there was a position as a yobidashi, so I decided to become a yobidashi. I belong to Kiriyama-beya. In my case, my uncle and the oyakata were acquaintances; therefore, I was introduced to Kiriyama-beya. LMdS: Can a yobidashi become a rikishi? Kokichi: Yes, it is possible if they are under 24 years old and can fulfil all of the physical requirements. However, no one has ever managed it. LMdS: Is there a special school for yobidashi? Kokichi: There is no institution or school as such. All yobidashi – both newcomers and experienced - gather together at the Kyoshujo (a school, situated in the Kokugikan in Tokyo, where a new rikishi is taught for his first six months), and practice together. Usually, seniors teach juniors. So I still practice and, sometimes, I teach juniors. LMdS: What is the typical day of a yobidashi like? Kokichi: As each basho approaches, we build a dohyo in the venue. During the tournaments, our work starts at 7:30 am. We maintain the dohyo, prepare sponsors' prize banners, mizuoke (wooden buckets with water, at the corners of the dohyo), etc. Usually these jobs are for junior yobidashi. As he becomes more senior, a yobidashi starts to be released from these chores. -> the rest of the time? Kokichi: Junior yobidashi live in their stables, where they have to wake up early. The day starts with checking the dohyo at the stable, and then they help cook the chanko and clean the stable. I live outside the stable, but I often go there. I also often visit some other stables to prepare dohyos together with other yobidashi. I have been a yobidashi for 22 years. At my age, I am not as busy as the young yobidashi are. I play with my kids when I am free. LMdS: Do yobidashi actually belong to a particular heya, or are they sometimes "lent" to other heya? Kokichi: Yes, each yobidashi belongs to a heya. Usually, there are no jobs for which yobidashi have to be "borrowed". But when we have to build a new dohyo in a stable, it is impossible to do with only one or two yobidashi, so, certain yobidashi from the same ichimon come to our aid. And if there are still not enough people to build it, then some yobidashi from other ichimon also come to help. LMdS: Who chooses the heya where a yobidashi will work? Kokichi: Well, it is the same as for the rikishi. I was introduced to Kiriyama-beya because my uncle and Kurosegawa oyakata were acquaintances. LMdS: How is a yobidashi's name chosen? Kokichi: In my case, I was a disciple of a yobidashi Kotaro. Because of this I received the prefix "Ko-" from his name and became Kokichi. But there are several ways to get a name. Some yobidashi are named by their oyakata. LMdS: Do you live at the heya? Kokichi: When we first join this world, all the young yobidashi live in the heya to which they belong. When they become sufficiently experienced, they are allowed to marry or simply move out of the heya. LMdS: Who pays you? Your heya? Kokichi: We receive our pay from the Nihon Sumo Kyokai. LMdS: How many yobidashi are there currently? Is there a maximum? Kokichi: There are 41 Yobidashi. * The maximum number is 45. LMdS: Is there a ranking system for yobidashi, like the banzuke for rikishi? Kokichi: Yes, but it is not as strict as the one for rikishi. It is usually based on seniority, but sometimes the "directors" of the yobidashi decide. These directors are yobidashi Katsuyuki, Kotoyoshi and Riki. The principle is as follows: the more experienced we grow, the later in a tournament day we go up on the dohyo to summon the higher-ranked rikishi. But our ranks do not go up and down as those for the rikishi do. The names of yobidashi are put on the same banzuke as those of the rikishi when they are "qualified" enough for it. These are usually the yobidashi who summon the sekitori (wrestlers ranked in Juryo or Makuuchi). From that moment on, same as sekitori, yobidashi can have a tsukebito (assistant). LMdS: Does the dress of a yobidashi depend on his rank? Kokichi: The costume is the same for experienced and junior yobidashi. It consists of kimono and hakama (Japanese style wide trousers). Yobidashi often decide on the colours and designs within an ichimon, but the kimono are usually given by sponsors. The sponsor's name is printed on the back of kimono. 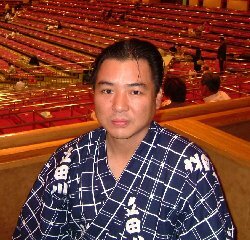 There are nine sponsors, so each yobidashi has nine different kimono which he wears during all 15 days of each basho. Of course, all of the kimono look similar in style, and they differ only in colour and the names of the sponsors. Hakama are presented by rikishi who have been promoted to Ozeki or Yokozuna. You can see that rikishi's name at top of the back of the hakama. LMdS: Are there "official" tools for yobidashi? 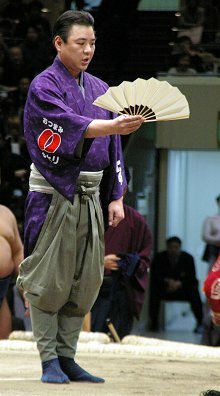 Kokichi: Our trademark is a sensu (a fan). 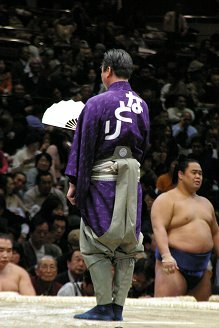 A yobidashi opens the sensu as he calls a rikishi to the dohyo. Kokichi: Taiko means yagura-daiko. It is a type of drum played to invite the spectators to come and see the daily bouts. It is placed at the top of the yagura, a tower about 16 m tall, on which the official banzuke is posted. All yobidashi practice taiko, and only after they have mastered it, they can perform the yagura-daiko in rotation. Those are usually young yobidashi. Kokichi: It is an instrument composed of two pieces of wood tied by a cord. The main purpose of hyoshigi is to give a signal to the rikishi in the shitakubeya (a dressing room). We let them know the time when they should start preparing for the dohyo-iri, their bouts, etc. The hyoshigi is made of cherry wood. LMdS: At what age does a yobidashi have to retire? Kokichi: When they reach 65. LMdS: Is a brand new dohyo built for each basho? Kokichi: Yes, the frame is maintained, but the clay is always new. LMdS: How long does it take to build a dohyo? LMdS: What are the main steps in the building of a dohyo? Kokichi: It is difficult to explain... but I will try to explain it simply: there are two main parts. The first is to build the dohyo with soil. The soil is placed in the frame, then it is patted down again and again. Then the tawara are made, filling straw bundles with soil. They are then placed in a circle on the dohyo. LMdS: Where does the soil come from? Kokichi: We use a sort of soil called "Arakida" when we build a dohyo in Tokyo. Arakida is the name of the place where the soil comes from. But we use different sorts of soil when we build dohyos outside Tokyo. LMdS: How many people are needed to build a dohyo? Kokichi: All the yobidashi participate in building a dohyo for the tournaments. LMdS: Are the yobidashi the only ones authorized to build a dohyo? Kokichi: When we build a dohyo for a jungyo, the locals help us because only a few yobidashi go to a jungyo. LMdS: Do yobidashi built a dohyo in each stable? Kokichi: Yes, it is a part of our job. LMdS: How are the yobidashi who introduce the rikishi on the dohyo chosen? Kokichi: All 41 yobidashi do this job. 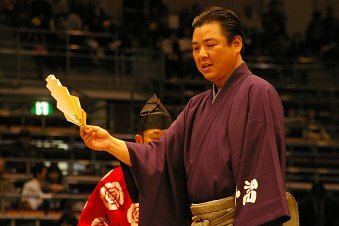 The order of appearance on the dohyo depends on rank, as I explained before. LMdS: Do you take special singing lessons to train your voice? Kokichi: No, no singing training as such (laughs)! The main point is to open your mouth wide and to produce the sound from your stomach. LMdS: How are the yobidashi carrying the sponsors' banners chosen? Kokichi: Usually it's the young yobidashi who do this job, in rotation. But, when there are really lots of banners, I still sometimes carry one. LMdS: Instead of a conclusion, would you like to send a message to sumo fans in the whole world? Kokichi: There are many nice guys among the yobidashi and gyoji (laughs). It would be even more interesting to watch sumo if you pay some attention to the yobidashi and gyoji, as well as the rikishi. Please come to Japan to watch sumo!